Italy?s Paolo Bettini has overcome numerous difficulties both on and off the bike to win the World Championships for the second year running. In a dramatic finale at the end of a gruelling 267.4km event, the Italian proved the fastest in a five-man sprint against Alexandr Kolobnev of Russia and Germany?s Stefan Schumacher. Fourth was Luxemberger Frank Schleck and fifth, Cadel Evans of Australia. With the bunch down to some 50 riders – including Britain’s David Millar – Bettini?s Italian squad forced the pace in the tougher first climb of the final lap, with a group of 15 riders finally going clear. Then, on the second climb, Bettini forged ahead with Schleck and Schumacher on his wheel. Kolobnev and Evans bridged across in the closing kilometres, with the Australian attempting – and failing – to surprise the group before the final sprint. Kolobnev led out the last dash for the line, but Bettini proved the stronger to become the first Italian since Gianni Bugno in 1992 to win the World?s two years in a row. That Bettini could take part in the World?s remained uncertain until 48 hours before the race. An attempt by the city of Stuttgart to bar Bettini from racing in the lawcourts because he had not signed the UCI?s anti-doping pledge in its full form this summer only failed on Friday. Bettini?s gesture of firing off a gun as he crossed the line was, he said later, a very direct comment on the immense pressure he has been under. Flanked by Pat McQuaid in the winner?s press conference, the UCI president said Bettini?s victory was ?magnificent. We can only give him praise and support? – something not so obvious earlier in the week, when McQuaid had attacked Bettini for failing to sign the pledge without any conditions. Big losers on the day were the Spaniards, the main pre-race favourites together with the Italians. Three-times World Champion Oscar Freire was waiting for a bunch sprint which never happened, and Tour of Spain star Samuel Sanchez tried one of his characteristic attacks on a descent – but could not get away. As for Alejandro Valverde, subject of so much controversy prior to the event, he played the role of domestique and finished 57th. David Millar was Great Britain?s only finisher after remaining with the lead group of 50 that started the last lap together. 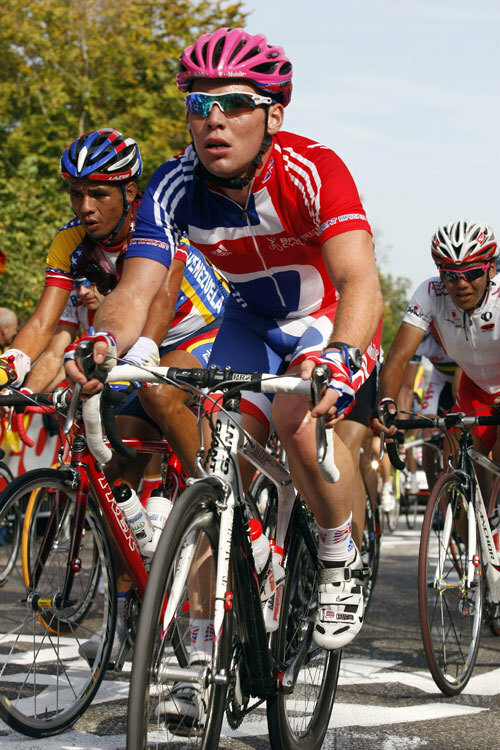 Neither Roger Hammond or Mark Cavendish finished.